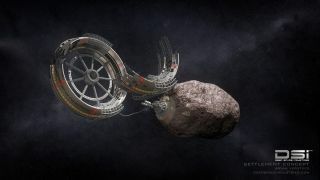 An artist's concept of a wheel habitat under construction at an asteroid, a vision of space settlement by the asteroid-mining company Deep Space Industries. SAN FRANCISCO - Legions of scientists, engineers and entrepreneurs are gathering in Silicon Valley this week to discuss the rise and impact of the commercial space industry. The Space Frontier Foundation's annual NewSpace conference runs from Thursday through Saturday (July 25-27) in San Jose, Calif. Among the many speakers are NASA deputy chief Lori Garver, Commercial Spaceflight Federation president Michael Lopez-Alegria and Congressman Dana Rohrabacher (R-Calif.). "The three-day event will focus on the current, near-term, and future potential and challenges of the emerging commercial space industry," Space Frontier Foundation officials wrote on the NewSpace 2013 website. "People from throughout the space, advocacy and technology industries to those in startups, government and media bring their ideas for opening the high frontier, making this conference a hotbed of innovation and partnership," they added. Panels at NewSpace 2013, which is being held at the DoubleTree Inn in San Jose, will address a variety of topics, including the commercial research potential of the International Space Station; the challenges and promise of space mining; new technologies that could aid space exploration and settlement; and the current legal landscape of space-resource utilization. Such discussions are becoming more and more timely, as the commercial space sector has been gathering momentum over the last few years. Virgin Galactic and XCOR Aerospace, for example, may begin launching paying customers to suborbital space within the next year or so. Further, two separate companies — Deep Space Industries and the billionaire-backed Planetary Resources — recently announced their ambitions to mine water and precious metals from near-Earth asteroids. And a handful of other firms, such as Moon Express and the Shackleton Energy Company, aim to extract resources from the moon.